This young couple was reunited from miles away, they proved to the world that long distance relationship still possible to two in love hearts. The relationship of Eugene Galang and Viktorija "Vika" Chaya Radavciute started from online chatting, to friendship and later into a lovers. The video of the two had gone viral when Vika visited the Philippines to see Eugene, however, their relationship become the interest of the judgmental people in social media world. But here comes "Vika" to defend her king from all his bashers by posting her disappointment to people who's putting down to their relationship. "Before I went in Philippines, they said Filipinos are really nice, always smiling, approachable and a lot of good things. "When I came in the Philippines I can say its true cuz I experienced it all. "But when I read comments here and translated, I didn't expect that Filipinos are like this mean to their fellow filipino and really so judge mental. "I just want to clear up that we planned that I will go to him first because it is the easy way. I just heard that Philippines immigration is really strict in Philippines specially on filipinos who will go out in the country. 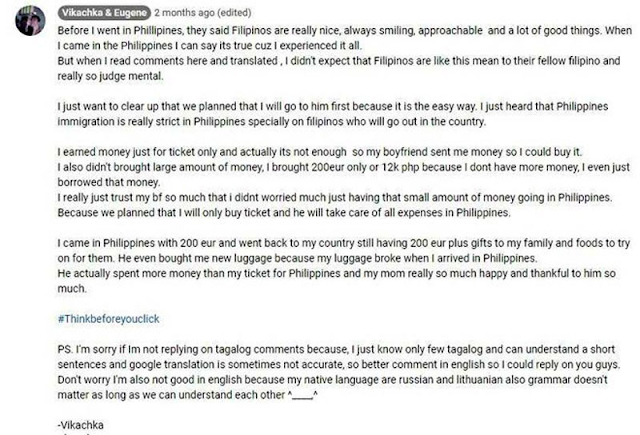 "I earned money just for ticket only and actually its not enough so my boyfriend sent me money so I could buy it. I also didn't brought a large amount of money, I brought 200eur only or 12k php because I dont have more money, I even just borrowed that money. "I really just trust my bf so much that i didn't worried much just having that small amount of money going in Philippines. Because we planned that I will only buy ticket and he will take care of all expenses in Philippines. "I came in Philippines with 200 eur and went back to my country still having 200 eur plus gifts to my family and foods to try on for them. He even bought me new luggage because my luggage broke when I arrived in Philippines. "He actually spent more money than my ticket for Philippines and my mom really so much happy and thankful to him so much.